The original question was: I have read your report on ‘fossil leaves found in a UK stalagmite’ less than 100years old. I need to know if your duplication of these actually produced fossils or just imprints in the limestone, which is not really a fossil, is it? How Fast Can Fossils and Stalactites Form? by Joseph Hubbard, here. 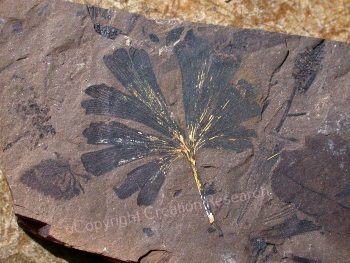 Duplicating Fossil Leaf Formation in Limestone, by John Mackay here. 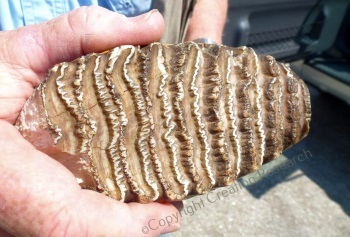 Since most people confuse the words fossilised and petrified, let’s sort that our first. Fossil is an old word from ancient Greece. Foss means “hole” and the il refers to what’s in it. Originally the word fossil referred to anything you dug up. Buildings, rocks, dead things that had somehow been preserved. Over the years our use of the word has narrowed it down to refer to only the remains of any animals or plants, or even trace clues in chemicals that an original creature existed. That’s why dinosaur or human footprints in the rock, or even a chemical residue of buried fish or plant qualify under the word fossil. So any clue that some form of life has been there is technically a fossil. Petrified literally means turned to stone, and it what most people think of as a fossil, but it is only one kind of fossilisation. Therefore, you can be a fossil without being petrified but you can’t be petrified without being a fossil. 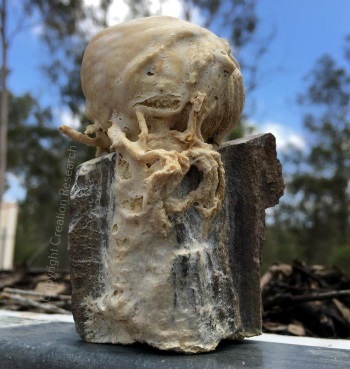 Original: where the actual creature is still there, such as a frozen Mammoth, or the green leaves found 600m (2000ft) deep in the Alaskan oil fields, or the original wood found up to 900m (3000ft) below the surface in Texas, or in the brown coal fields of Southern Australia. 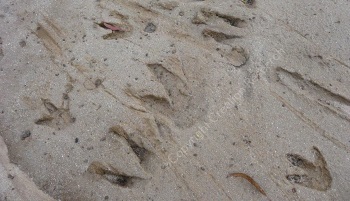 Imprint: where all organic remains of a structure, e.g. a leaf or fish, have visually disappeared but a 2D ‘print’ of the creature shows its outline or form. Mould: where the creature has disintegrated but its full 3D shape has been preserved by what it has been buried in. 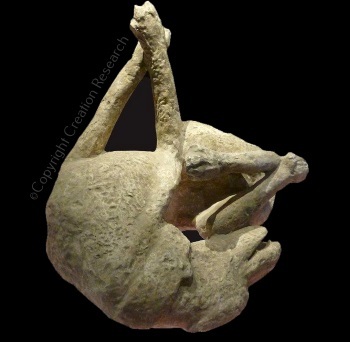 The Roman people at Pompeii who were covered in ash from the Mt Vesuvius eruption qualify as fossils in this way, as was this dog. We know what they looked like since you can pour plaster into the cavity and make an exact replica or cast of the person. Cast: where a mould has been naturally filled with sediment or minerals leaving an exact copy. 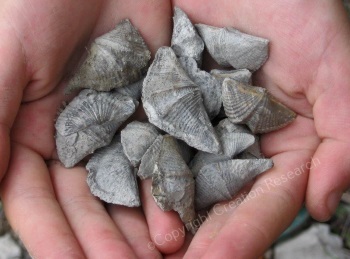 Shells are often found fossilised this way, particularly after the shell has also dissolved away. Altered: where the organic chemicals in a plant have been reduced to a dark grey to black carbonised film of the plant which still shows its shape and external structure. Sometimes carbonised plant remains are so abundant you can see no individual plants, and we refer to such a deposit as coal. Hence the term ‘fossil fuel’. Mineralised: where the spaces in a creatures hard parts are filled with a mineral that has come in after the creature has been buried. The original woody tissue of a branch, tree trunk or bone is still there. 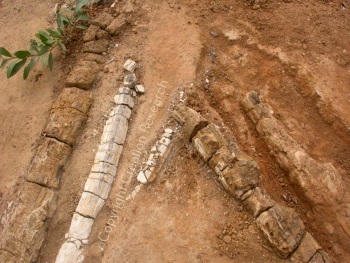 Many dinosaur bones are of this type. The most obvious results of this type of fossilisation are an increase in weight and a colour change. Trace: where no remains of a creature exist except at best a trail or footprint, or sometimes a unique chemical signature such as phosphate minerals from a huge number of fish skeletons. Even oil can be placed in this category. Replaced: where the whole creature or plant has been chemically replaced or altered so that what remains is an exact copy of the original sometimes down to even microscopic detail. When the original was wood, and the chemical involved is silica, we say it has turned to stone or has been petrified. So what are the leaf remains have we found under bridges or made in our experiment at Jurassic Ark? 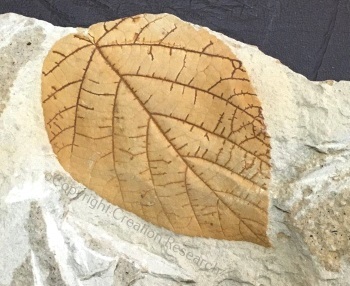 In each case the leaves are covered and preserved in Calcium carbonate in a minimum of two weeks, via imprint or cast, and are still recognisable as particular species of leaves. Our duplicates are not yet petrified, but we suspect if they are left under the same conditions they may well be, and you will certainly be informed by us when that happens in less than 10,000years. 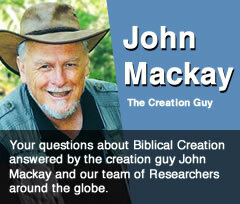 We will continue the experiments and report our results on the Creation Research website. Read reports of the experiments so far here.